A fast growing tree in the legume family. Black locust grows 30-90' with a trunk up to 4' in diameter. Because it forms large multiple-stemmed clones it can take over large areas. Fruits & Seeds: Flat, shiny, brown pods that are 2-6" long consist of 4-8 seeds. Seed pods often stay on tree all winter. Roots: Extensive system of fibrous roots and shallow rhizomes. 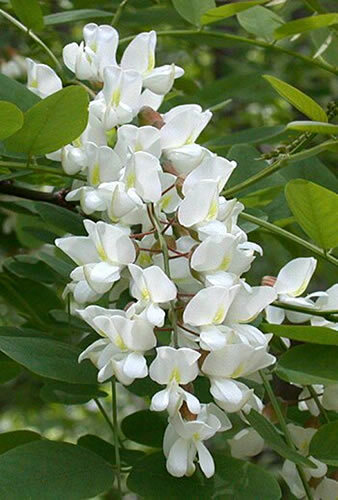 Black locust invades forests, prairies, oak savannas, pasture, fields and roadsides.